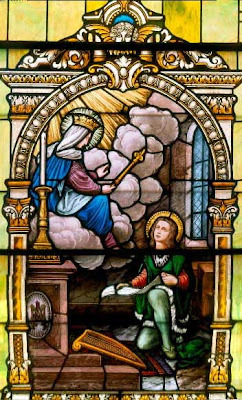 Otherwise known as St. Casimir - St. Casimir was possessed of great charms of person and character, and was noted particularly for his justice and chastity. Often at night he would kneel for hours before the locked doors of churches, regardless of the hour or the inclemency of the weather. He had a special devotion to the Blessed Virgin, and the hymn of St. Bernard of Clairvaux, "Omni die dic Marix mea laudes anima", was long attributed to him. After his death he was venerated as a saint, because of the miracles wrought by him. Sigismund I, King of Poland, petitioned the pope for Casimir's canonization. Prince of Poland, born in the royal palace at Cracow, 3 October, 1458; died at the court of Grodno, 4 March, 1484. He was the grandson of Wladislaus II Jagiello, King of Poland, who introduced Christianity into Lithuania, and the second son of King Casimir IV and Queen Elizabeth, an Austrian princess, the daughter of Albert II, Emperor of Germany and King of Bohemia and Hungary. Casimir's uncle, Wladislaus III, King of Poland and Hungary, perished at Varna in 1444, defending Christianity against the Turks. Casimir's elder brother, Wladislaus, became King of Bohemia in 1471, and King of Hungary in 1490. Of his four younger brothers, John I, Albert, Alexander, and Sigismund in turn occupied the Polish throne, while Frederick, the youngest, became Archbishop of Gnesen, Bishop of Cracow, and finally cardinal, in 1493.